The launch of the RD250LC saw the emergence of the quarter-litre water-cooled screamers and would put yamaha back at the top of the pile. In Jap land and the U.S it was known as the RZ as was the YPVS models that followed. The LC would play a major part at the home and in the jap market right up to the present day. 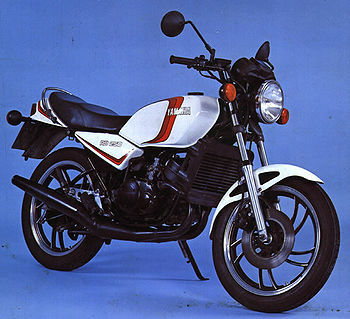 At that time the Suzuki X7 having given the ageing A/C RD a good wuping something new was desperately needed by Yamaha. As a replacement for the ageing and heavy air-cooled RD series, which had been around since the dawn of time. The LC as it became known was the instant and unchallenged top dog. Best of all back then you could ride it on "L" plates. The new mono shock suspension and up dated TZ derived frame provided a stable ride with improved handling over the earlier A/C RD's. Witch shows how bad the old twin shock Rd's are cos we all know a standard LC an't no bed of roses to ride fast. This page was last edited on 21 January 2011, at 18:08.